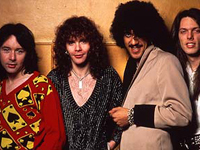 Despite a huge hit single in the mid-’70s (“The Boys Are Back in Town”) and becoming a popular act with hard rock/heavy metal fans, Thin Lizzy are still, in the pantheon of ’70s rock bands, underappreciated. Formed in the late ’60s by Irish singer/songwriter/bassist Phil Lynott, Lizzy, though not the first band to do so, combined romanticized working-class sentiments with their ferocious, twin-lead guitar attack. As the band’s creative force, Lynott was a more insightful and intelligent writer than many of his ilk, preferring slice-of-life working-class dramas of love and hate influenced by Bob Dylan, Bruce Springsteen, and virtually all of the Irish literary tradition. Also, as a black man, Lynott was an anomaly in the nearly all-white world of hard rock, and as such imbued much of his work with a sense of alienation; he was the outsider, the romantic guy from the other side of the tracks, a self-styled poet of the lovelorn and downtrodden. His sweeping vision and writerly impulses at times gave way to pretentious songs aspiring to clichéd notions of literary significance, but Lynott’s limitless charisma made even the most misguided moments worth hearing. After a few early records that hinted at the band’s potential, Lizzy released Fighting in 1975, and the band (Lynott, guitarists Brian Robertson and Scott Gorham, and drummer Brian Downey) had molded itself into a pretty tight recording and performing unit. Lynott’s thick, soulful vocals were the perfect vehicle for his tightly written melodic lines. Gorham and Robertson generally played lead lines in harmonic tandem, while Downey (a great drummer who had equal amounts of power and style) drove the engine. Lizzy’s big break came with their next album, Jailbreak, and the record’s first single, “The Boys Are Back in Town.” A paean to the joys of working-class guys letting loose, the song resembled similar odes by Bruce Springsteen, with the exception of the Who-like power chords in the chorus. With the support of radio and every frat boy in America, “Boys” became a huge hit, enough of a hit as to ensure record contracts and media attention for the next decade (“Boys” is now used in beer advertising). Never the toast of critics (the majority writing in the ’70s hated hard rock and heavy metal), Lizzy toured relentlessly, building an unassailable reputation as a terrific live band, despite the lead guitar spot becoming a revolving door (Eric Bell, Gary Moore, Brian Robertson, Snowy White, and John Sykes all stood next to Scott Gorham). The records came fast and furious, and despite attempts to repeat the formula that worked like a charm with “Boys,” Lynott began writing more ambitious songs and wrapping them up in vaguely articulated concept albums. The large fan base the band had built as a result of “Boys” turned into a smaller, yet still enthusiastic bunch of hard rockers. Adding insult to injury was the rise of punk rock, which Lynott vigorously supported, but made Lizzy look too traditional and too much like tired old rock stars. By the mid-’80s, resembling the dinosaur that punk rock wanted to annihilate, Thin Lizzy called it a career. Lynott recorded solo records that more explicitly examined issues of class and race, published a now-out-of-print book of poetry, and sadly, became a victim of his longtime abuse of heroin, cocaine, and alcohol, dying in 1986 at age 35. Since the mega-popular alternative rock bands of the mid-’90s appropriated numerous musical messages from their ’70s forebears, the work of Phil Lynott and Thin Lizzy will hopefully continue to be seen for the influential rock & roll it is.